Resembling the iron bowl from which it gains its name, the Mortar was created to lob shots over intervening walls. 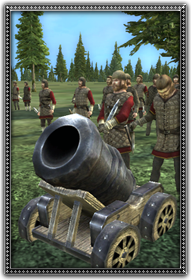 Useful in dealing with units skulking behind walls for protection, or to whittle away besieging troops outside your own walls. The mortar's capabilities makes it an excellent siege weapon for both attacker and defender.